which again contained 72 cantatas for all Sundays and special feast days of the church year. The title alone reveals the possibility of various scorings. Two violins can in principle perform all instrumental parts. When the voice part has a tacit the instrumental parts are notated in cue notes. This will enable the keyboard instrument to take over the instrumental parts if necessary. A larger scoring is a further option. This is marked by 'tutti' and 'soli' in the parts indicating which passages can be performed with stronger and softer (solo voice) volume. When performing in a solistic setting 'tutti' and 'solo' are to be understood as 'forte' and 'piano'. The soprano part can also be sung by a tenor. The same applies to the alto voice, which can be replaced by a bass. The cantata "Gott weiß, ich bin von Seufzen müde" presented here derives from the 1731 cycle and is written for the 3rd Sunday after Epiphany (Three Kings). The two parts indicated with "Violino ò Flauto dolce, l'ottava più alta." have the range g–g2 and can be played by violins as written or by 2 treble recorders an octave higher. The texts for the cantata cycle of 1731 are taken from passages from the volume "Ruhe nach geschehener Arbeit" by Tobias Heinrich Schubart (1699–1747) published by Kißner, Hamburg 1733. Telemann must have known the lyrics long before they were published. This is not surprising since Schubart served as a preacher at St. Michaelis in Hamburg. The vivid and partially drastic language Schubart uses in his small religious dramas or operas seems a little dated. The message they bear is that there will be salvation in a world hereafter and that the present world represents nothing but a vale of tears. 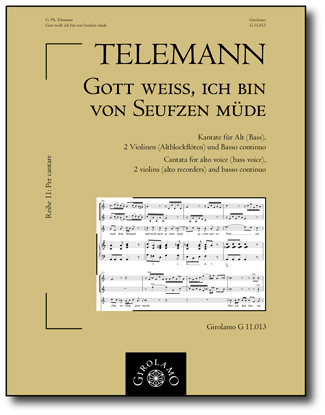 Telemann however succeeds to elevate the lyrics and their cryptic meaning by his ingenious hand. Thus they should be understood as a testimony of that period and not be rejected a priori. Nobody refrains from performing Bach's cantatas, which have similar texts. Our edition is strictly in line with the edition published in 1731 which is kept at the Royal Library, Copenhagen, comprising a score and two instrumental parts. Additions made by the editor are indicated in the score. mein Bette schwemm' ich jede Nacht! ich leb' und wollte gerne sterben. dahin wo ewig Wonne lacht! Ach! Herr, Herr, wie so lange? und lass die Unruh einmal ruhn! Du sprichst: ich will es tun. der heilen will und kann. Wie? Sollt' ich noch verzagen? Nein, nein, ich trotze Not und Plagen. werd't ihr als anmutsvoll betracht't. wo Pein ein Zähneklappern macht. Gottlob, nun ist mein Lauf vollbracht. My bed is flooded night for night! I am alive and yet yearn to die. To where bliss forever reigns. Oh! Lord, Lord, what so long? And allow the restlessness to rest for once! You speaketh: I will concede. Who will and can cure. No, no, I defy distress and torment. I will regard with lovingness. Where pain makes your teeth gnash. Thank God, my course of life is done.